Nintendo's summer marketing campaign has been unveiled, with the focus squarely on getting Wii n00bs online. 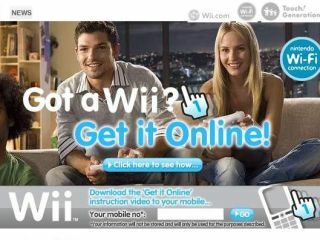 The new eight-week 'Get it Online' marketing campaign put together by London-based Candyspace media pushes the online capabilities of the Wii. The campaign has kicked off with a huge banner on the official Nintendo site, as pictured here, which takes you through a simple series of steps, should you not have been able to hook up your Wii to your home network already. It also incorporates lots of tantalizing footage of some of the Wii's best multiplayer online games such as Super Smash Bros. Brawl, Pro Evolution Soccer 2009 and Mario Kart Wii feature and some of the online features such as the Wii Shop and web browser. Microsoft's Xbox Live is predicted to generate £680m in subscription fees by 2013, according to research firm In-Stat, so it is hardly surprising that Nintendo is – finally – stepping up its game in the online space.